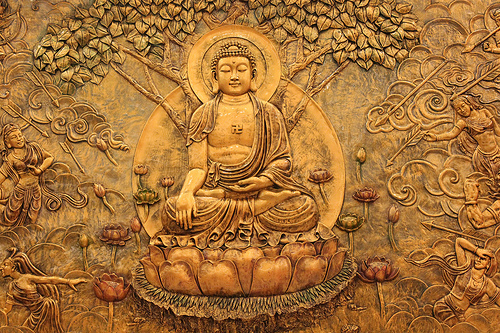 8 Apr 2019 – Today is the anniversary of the Buddha’s birth—born Siddhartha Gautama, the founder of Buddhism, the fourth largest religion in the world. Visitors to shrines on his birthday take an offering of fresh spring cherry blossom flowers. As a prince in northeastern India, he lived a life of luxury until, at the age of 29, he saw an old man, a sick man, and a family mourning their dead. Like all Hindus, the prince believed in reincarnation. The thought troubled him that people had to return to this world to suffer again, so he left his wife, child, luxurious lifestyle, and future role as a leader of his people, to search for an end to suffering. For years he chose a life of extreme poverty. The story goes that he eventually collapsed from starvation after fasting for six years. Next, he turned away from the idea that poverty is the path to enlightenment and he decided that it is best to pursue a “Middle Way” between luxury and poverty, largely defined by moderation and meditation. At 35 he attained enlightenment (Nirvana) and assumed the title Lord Buddha (one who has awakened). Sila: Virtue, good conduct, morality. This is based on two fundamental principles: The principle of equality: that all living entities are equal and the principle of reciprocity: This is the “Golden Rule” in Christianity — to do onto others as you would wish them do onto you. Samadhi: Concentration, meditation, mental development, which leads to personal freedom and helps us maintain good conduct. Celebrations in Japan, Taiwan and Korea include children pouring sweet tea (hydrangea leaf amacha) over the head of the statue of an infant Buddha because some believe it rained tea on the day he was born.